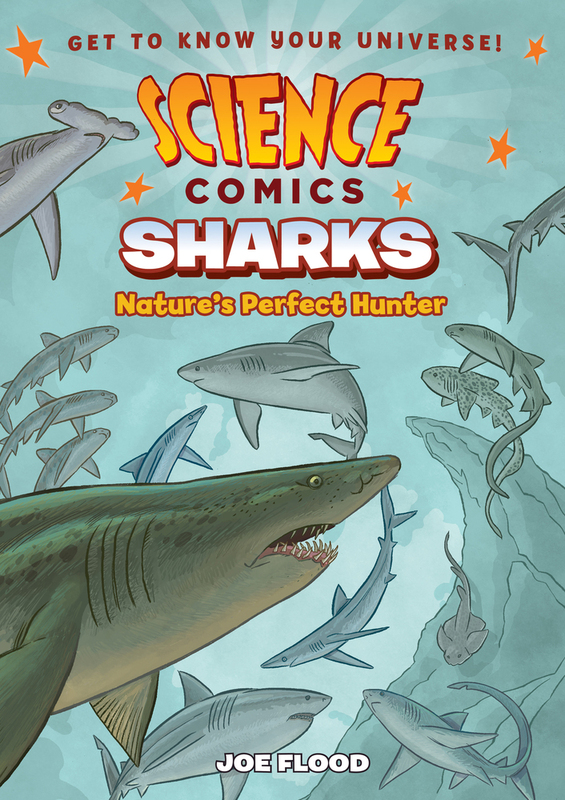 Shark Week doesn’t come around until mid-July, but the magnificent Science Comics line has a new book out to tide us over. Sharks: Nature’s Perfect Hunter, by Joe Flood, is entertaining, informative, surprising, and its environmental call to action will inspire young readers to pay attention to sharks as co-habitants of Earth and not enemies. From the opening note by Marine Conservation Biologist, Dr. David Shiffman, to the final frame of this graphic text, Sharks: Nature’s Perfect Hunter doesn’t shy away from focusing the reader’s attention on human responsibility in both the misunderstanding of sharks and the threats to their existence. With mentions of actual shark encounters, Hollywood’s influence, and markets for shark fins and souvenirs, the book firmly and gently places the onus on the reader to do better. The book spends a good amount time on shark anatomy, including cartilage, organs, and the shark’s impressive sense of smell. With illustrations showing the spinal column, a cross-section of the shark’s body to highlight muscles, and various detailed jaw examples, Joe Flood makes sure readers have a comprehensive idea of how sharks work. This is especially important when the book pinpoints the shark fin trade in all its irony and gore. A wide array of shark species are highlighted in the text and with colorful and detailed illustrations. Using a narrative that includes a captain and a group of “land-lubbers” who know a lot about ocean life, including sharks, we learn about the terrifying Goblin Shark, the pain-inducing Cookie Cutter Shark, and the toothless Whale Shark. Sharks: Nature’s Perfect Hunter also dips into folklore, prehistoric times, and the shark’s defenses that have nothing to do with its teeth. The accessible glossary (complete with really cool drawings of shark egg cases!) and a busy Shark Family Tree at the back of the book, make sure young and adult readers alike will find the book entertaining and informative. In addition, you’ll be well-versed in shark facts when Shark Week comes around! Highly recommended for ages 9-13 and beyond. Sounds like a really informative read. Sharks kind of freak me out, but I still appreciate that the book talks about why they should not always be feared and why they are important. I think this sounds super interesting! Love that this is a science comic! Think my daughter would love this! They will both learn a lot!